Check out a previously unheard live recording of The Band's "Life Is A Carnival"
In December 1971, The Band played four live shows at New York’s Academy Of Music, bringing guests with them like Allen Toussaint and Bob Dylan. Some of the recordings from those shows were made into a double LP, Rock Of Ages, released in 1972, but the vast majority of the songs recorded from the soundboard have been unreleased until now. 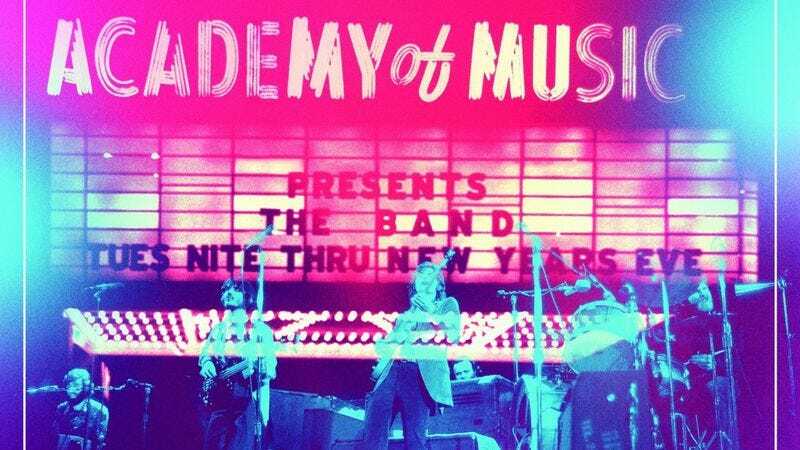 Sept. 17, Capitol/UMe will release The Band’s Live At The Academy Of Music 1971. The 4-CD/1-DVD set was produced by Robbie Robertson, and includes both stereo and 5.1 surround mixes of much of the material recorded that week, including The Band’s complete New Year’s Eve set. The A.V. Club has the exclusive premiere of the soundboard mix of those songs unheard until now. “Life Is A Carnival” is streaming below. Live At The Academy Of Music comes packaged with a 48-page hardbound book featuring previously unseen photos, a reproduction of Rolling Stone’s Rock Of Ages review, an essay by Robertson, and notes of appreciation from both Mumford & Sons and My Morning Jacket’s Jim James. The whole set is available for preorder now.